← Should the Euro Survive? This entry was posted in Business - General, Lifestyle, Recession, Uncategorized, Upturn and tagged 2012 Summer Olympics, Britain, Business, Economy, Government, Leadership, Olympic Games, Recession. Bookmark the permalink. Guy, having lived and worked in London for 15 years I have a completely different experience of the British. They are positive and enormously proud of their country. The gloom you describe I’m certain has happened because of the global recession and how it has impacted the UK. 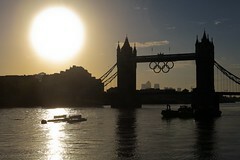 If the Olympics can get them back into an upbeat mode it could have an impact on the history of the British Isles. Thanks Catarina. In the nearly 2 years I’ve been here, pessimism has been the dominant theme. The people are pretty nationalistic, but don’t have the spark that comes with real national pride. Much, I believe, is down to the removal of the competitive spirit as schools have all but eliminated competition – the last government wanted everyone to feel equal. It will be great if this can all be turned around as Britain certainly has plenty to feel proud of, and good about, and a positive sentiment overall will drive markets forward.